GM put out a great press release late last week giving us some new details about the reworked Test Track experience, and today Disney has a new update giving us a few more details. The new Test Track officially opens on December 6, 2012, with some limited soft openings expected before that date in late November. Read on for the full Disney press release. LAKE BUENA VISTA, FL. 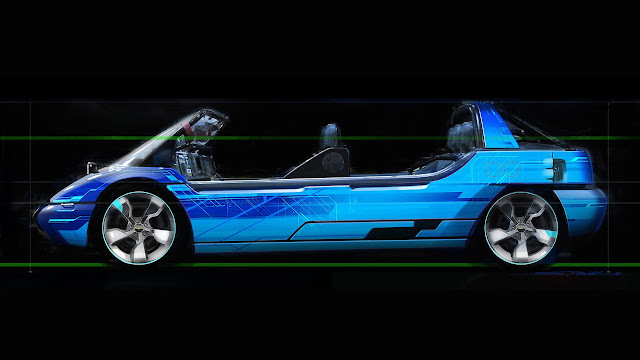 – Walt Disney World Resort guests will experience the thrill of designing their very own virtual vehicle – then putting their design through its paces – when the re-imagined, multi-sensory Test Track Presented by Chevrolet grand re-opens Dec. 6, 2012. The iconic Epcot attraction, a new collaboration between Chevrolet Design and the creative team of Walt Disney Imagineering, celebrates how meticulous design not only shapes the look of Chevrolet cars and trucks, but drives their performance on the open road. Amid upbeat music, eye-popping lighting effects and a collection of Chevrolet concept cars and model vehicles, guests themselves will become automotive designers – and peer into the future of personal transportation in the process. At design kiosks, rows of touch screens become canvasses for guests to try their hand at design magic. Here, they can virtual-draw – maneuver their vehicle design by shape, length, width and engine size. Once they create the design of their dreams, guests complete their creation with even more choices. They can make a design statement with an expressive front grill, order up wheels by size and style, add paint and other graphics and trick out their vehicle – top to sides, front to back – with the latest accessories. Then comes the crowning touch of their design – adding Chevrolet’s world-famous bowtie logo. Their virtual Chevrolet vehicle complete, the adventure then shifts into high gear as guests – armed with a card encoded with their personal design that travels with them – board their 6-person “SimCar” ride vehicle. Ahead: a thrilling journey into a dazzling multi-sensory digital experience as guests put their personal design through a series of performance tests – the exhilarating heart of Test Track Presented by Chevrolet. Along their route, riders experience changing terrain and extreme conditions as their designs are scored for Capability, Efficiency, Responsiveness and Power. How does their design stand up on the challenging hills, switchbacks and straight-aways of the Test Track circuit? How well does it navigate through bumpy roads, icy conditions, turn-on-a-dime curves and other surprises? Their design skills are put to the test – at speeds of up to 65 mph. The fun and excitement continues in the post-show area. • At a digital driving table laying out a road course, guests can race their virtual custom-concept vehicles against other guests’ designs, over changing terrain and encountering extreme conditions. • Brand-new car designers can create their own commercial – starring their virtual car. • In another experience, guests get to pose with actual Chevrolet vehicles. Through green screen technology — with a few taps on their touch screen – guests can suddenly find themselves posing with their Chevrolet on the lunar surface, arcing across the galaxies, navigating the bright-white of a polar landscape or other thrilling scenes. The images become easily sharable on social media, sending virtual postcard greetings to family, friends or co-workers back home. • New and concept Chevrolet vehicles are laid out showroom-style. Guests can get behind the wheel of Chevrolet’s latest models. Chevrolet product specialists are on hand to answer any questions.